We have written many times about the geology of southern Israel in our blog posts over the past two years, and there is plenty more to come this week. We haven’t discussed the little town we stay in during our expeditions. So I’m starting with an image of Will Cary overlooking the Makhtesh Ramon for the geological context, but it is the community behind him that interests us today. 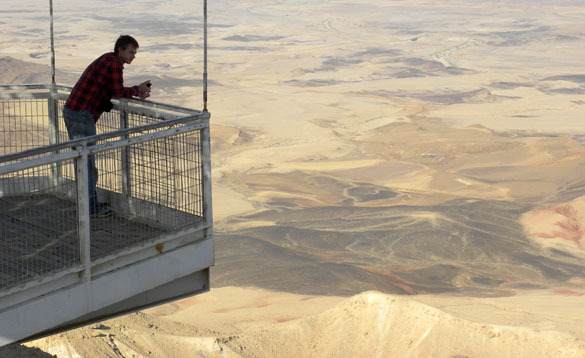 Mitzpe Ramon was established on the northern edge of the makhtesh in 1951 as a way station and workers’ village on the road to the southern city of Eilat. It has a magnificent perspective on the makhtesh, and thus the Hebrew name means “Ramon view”. The first permanent residents came in the 1960s as refugees from northern Africa and central Europe. Later immigrants came primarily from the United States and Russia. 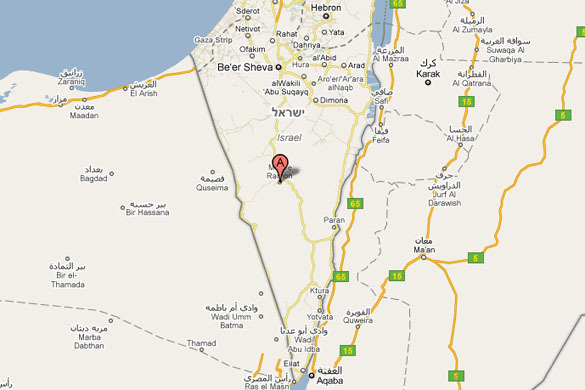 Map of southern Israel and its neighbors (from Google) with Mitzpe Ramon pinned in the center. This mix of heritages gives this little town a unique community unlike any other in Israel. Large numbers of Black Hebrew Israelites left the United States in the 1960s and 1970s to settle in Israel. This group believes, essentially, that they are a “lost tribe” of Israel, some maintaining they are the only true Israelites remaining. You can imagine the controversies they stirred in Israel with such claims, so many began to settle in the more distant Negev development towns where they would be out of the mainstream of Israeli national life. Now a generation later they are full Israeli citizens and integrated enough into Israeli society to serve in the military and hold political offices. The Black Hebrew Israelites in Mitzpe Ramon wear knitted kippot (head coverings) and a colorful style of dress that looks to me right out of 1970 Harlem. They speak English among themselves (and to us), and they’ve established American jazz clubs in this little desert town. An elevated view of Mitzpe Ramon I took in September 2009. Walking through the neighborhoods of Mitzpe Ramon you see a complex mix of cultures, from old Russian men sitting on benches with suit jackets and tightly buttoned shirts (regardless of the temperature) through fresh-faced (and always well-armed) soldiers the age of my students to African-American-Israeli children singing in the playgrounds in Hebrew while their parents converse in English. Above it all a bright blue desert sky, and below some of the most fascinating rocks in the world. 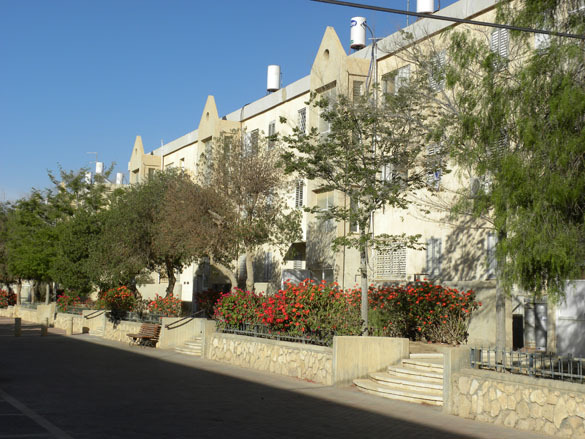 A neighborhood block in Mitzpe Ramon.